Show off your desktop! This time no t-shirt. Some short info is sufficient. If you have questions ask politely and we will share. I am very pleased with Devuan 2.0. Minimally customized spectrwm with conky showing basic info in the bar. 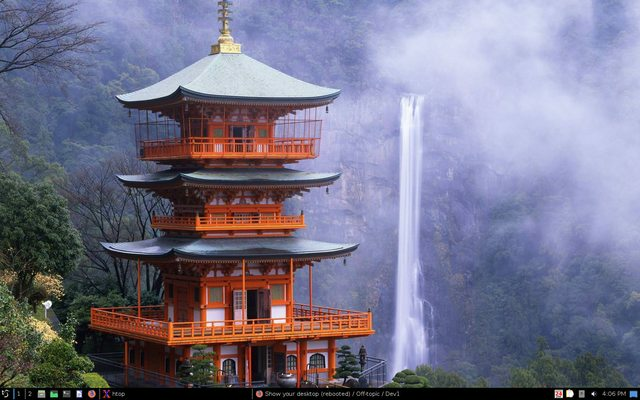 Here my desktop. Nothing special, just Ratpoison wm. Thanks to ivanovnegro for bringing the " blown-away" advert image for Maxwell recording tapes forward from the 1970's, has always been one of my most admired ads from those years. Didn't know until I saw the video...no way I thought but happy we all had a chance to participate and support Devuan! PekWM with tint2...just now found time to start trying to configure it a little bit...gotta do something with that default menu. Still playing with PekWM...and REALLY liking it! Why is this window manager lesser known and not more widely used? Got the right-click menu more to my liking, and I substituted the tint2 panel with fbpanel. So now, I have stinkin' dynamic menus all over the stinkin' place...and it's still light on resources! Still more work to do and stuff to discover n'stuff. Today i messed with JWM aswell, i was a bit overjoyed. I got something made, but I was not that happy at the end. I'm not very familiar with this stack WM, i even forgotten Openbox config after a long time with tiles. Heavy inspired by addy-dclxvi, i even use one of his Openbox theme, slightly modified for my needs. Qogir Gtk Theme Really great GTK2/3 theme, based on Arc gtk by horst3180. Rest: tint2, conky-std, compton & obmenu. Nice scrot their Nili, that theming looks great. I do like that font you are using too, will have to try and find it. @Panopticon, Thanks mate Font is Iosevka (download) v1.14.3 is the newest. CROWZ 2.0 Openbox with obmenu-generator providing the menu. ^ WOW! Awesome wallpaper for CROWZ, like it a lot! Love your artwork, gonna have to let me borrow it! Have played around with obmenu-generator in the past, looks great! @ Nili: STAR and CROWZ both use the JWM setup similar to Manjaro, where the configuration files are in usr/.config/jwm. Not sure if this was what you were describing as your attempt. Oh dear...before I saw this, I got rid of that wallpaper and replaced it with another one that I made. The new one looks very similar, but I used a different font for CROWZ. I went ahead and uploaded it to my pCloud account in case you might want it. The link will show you a preview. So, it's at the link below if you want to check it out. It's 1920 x 1080. Thanks! Very nice you used the font from CROWZ obmenu header! Hmmm...gives me idea for the next release! ^ With your permissions of course! I appreciate that, but you don't need my permission. If I do anything that folks want to use in any shape, form, or fashion...I'm glad to have been of service. 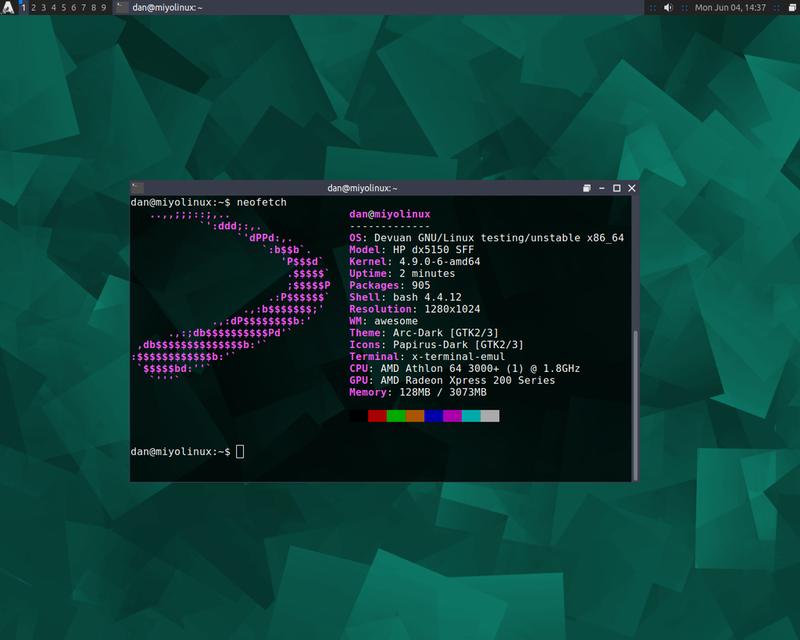 I wouldn't care if Debian, Ubuntu, or Manjaro used something of mine without asking. ...in fact...I'd like to see it! 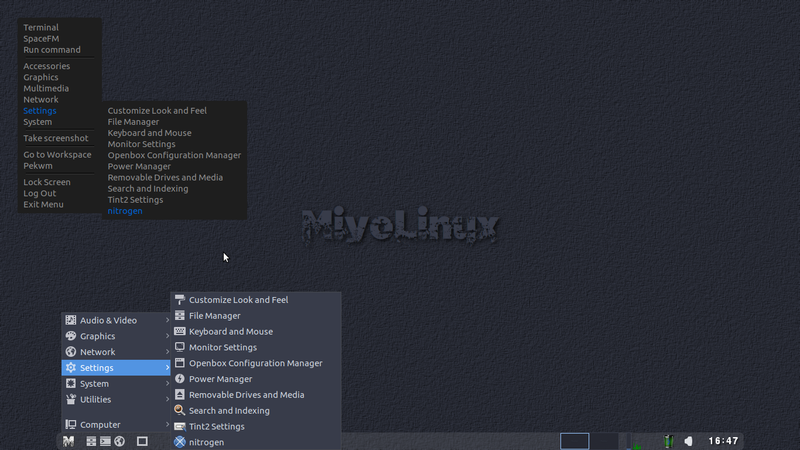 A new release of Manjaro with a MiyoLinux wallpaper that still says MiyoLinux on it! LOLOLOLOLOLOL!!! ^ Have always respected intellectual property and especially artistic expression so never just assume. Thank you immensely, maybe we could discuss a set for all 3 distros at some point with fb and jwm? A new release of Manjaro with a MiyoLinux wallpaper that still says MiyoLinux on it! Wouldn't that be a kicker for that to happen! 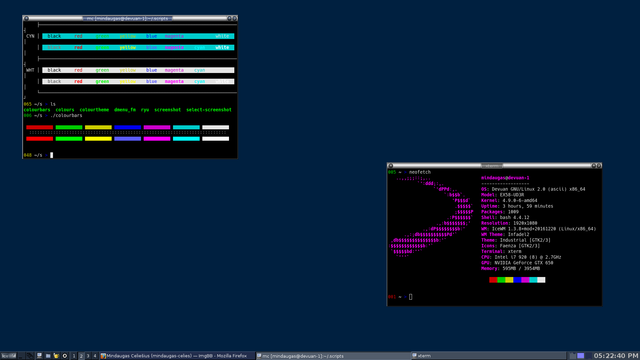 Have seen grub screens reused with other distros name very faintly in the background. I'd like to show you my boring setup. 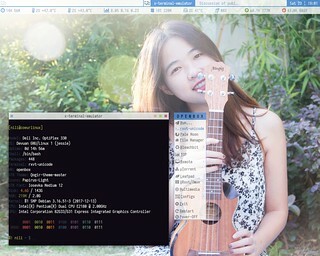 It's Trinity-desktop running on Devuan Jessie. I am well pleased with it's good old fashioned look. Thank you for this great OS. Still playing with PekWM...and REALLY liking it! Why is this window manager lesser known and not more widely used? I've been using it for years. Every so often I try others but always come back to it. Not much point in posting my desktop. It's just a black screen with a mouse cursor. Perhaps that's one of the reasons it is lesser known--nothing flashy, nothing to show off. Xmonad and Trinity. You guys rock. Not that they have something in common but they both are as old school as it gets. Wallpaper by Miyolinux (of what you see of it), Clementine background using ivanovnegro's blown-away man! Black Sabbath in my headset! Lots of cool looking desktops. Hi, let me share an other Devuan setup. Devuan Jessie with BunsenLabs configs, and of course Openbox.